Barcelona is the second most populated city in Spain after Madrid and is located on the shores of the Mediterranean Sea. This metropolis is the capital of the autonomous community of Catalonia and is a popular destination thanks, in large part, to its beaches that receive an estimated seven million bathers a year. 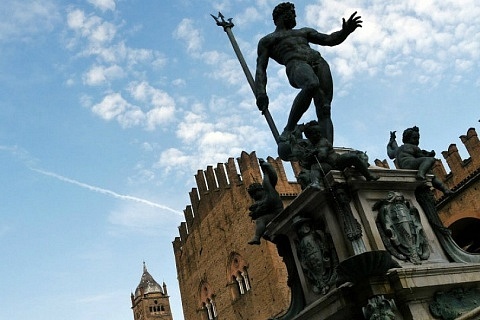 Barcelona was founded by the Romans at the end of the 1st century a.c. under the name of Barcino. This city is famous, among other things, for being the first to demolish the walls that surrounded it to carry out a expansion project, which was in charge of Ildefons Cerdà in 1860. The expansion(also known as Plan Cerdà or “Eixample” in Catalan) sought to avoid overpopulation in the Historic Center of Barcelona and, at the same time, improve health conditions, which made the project an example for other major European cities. Years later, for the Olympic Games of Barcelona 1992, improvements were made in the city that ended up consolidating it as a popular tourist destination. Among the changes, the highlights were the conditioning of the beaches, the construction of commercial buildings and the expansion of metro lines, avenues and accommodation options. This beautiful Catalan city has a privileged weather, with winters that are tolerable (in comparison to other European cities), temperatures that hover around 30ºC in summer and that are especially pleasant during the fall and spring. 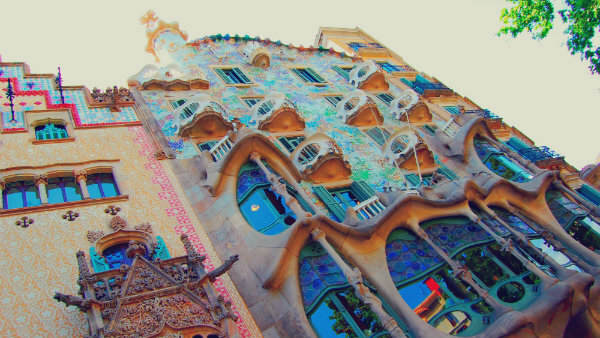 Therefore, the best time to visit Barcelona will depend on your interests and budget when traveling. If, for example, you want to know Barcelona’s beaches, spring and summer are ideal, although during the summer the accommodation tends to be more expensive and the beaches are more crowded with tourists. On the other hand, if your intention is to visit the historical attractions of the city, autumn is also a good option when planning your trip to Barcelona. As far as transportation options are concerned, Barcelona has an efficient metro system that runs through most of the city. Similarly, it also has commuter trains (which reach the beaches and surroundings of the city), as well as light trains and trams. Therefore, it is not complicated to move around in the streets of Barcelona. 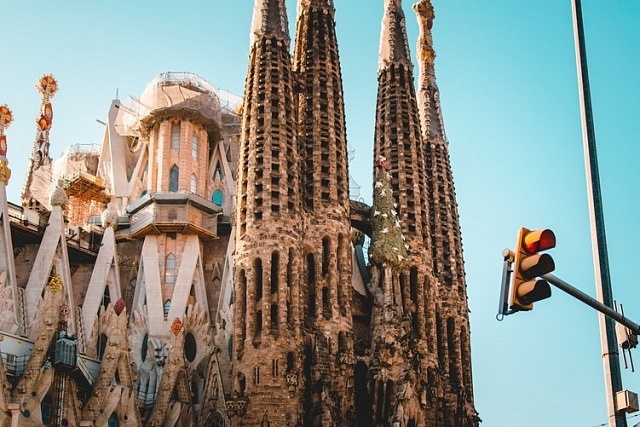 Barcelona has a lot of attractions to visit, one of the most important being the Sagrada Familia by Antoni Gaudí (Basilica and Temple Expiatori of the Sagrada Família in Catalan), a famous unfinished Roman temple, declared a World Heritage Site by UNESCO. Likewise, Gaudí is also responsible for the incredible Parc Güell (Park Güell), a work of modernism inspired by English gardens. Another mandatory stop for those who visit the city is the Barri Gòtic (Gothic Quarter), one of the best areas to stay in Barcelona, ​​thanks to its historical value ( See accommodation in Barri Gòtic). On the other hand, the Born neighbourhood is the ideal place for those looking to enjoy Barcelona’s nightlife (See hotels in Born). 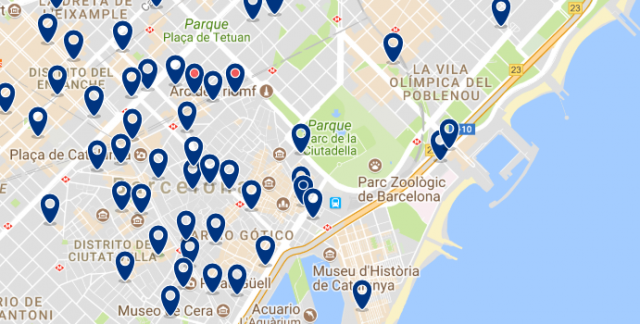 Here is a guide with the best areas to stay in Barcelona. Born is one of the most charming neighbourhoods in Barcelona and is part of the Historic Centre of the city. Taking a walk through its narrow cobbled streets (mostly pedestrian) means surrounding yourself with medieval architecture and returning to the past of the Catalan metropolis, even for a couple of hours. Among the many things to see in Born are the renowned Church Basilica of Santa Maria del Mar, a famous building in Catalan Gothic style that you will love if you are a fan of architecture or design and it is located in the Passeig del Born. Artists will also find inspiration in this area if they visit the Picasso Museum, which houses more than 4,000 works by the artist that show his deep relationship with Barcelona and is on Montcada Street, a street full of medieval buildings. Born is also home to points of interest such as Barcelona’s Arc de Triomf and the Palau de la Música, an impressive modernist concert hall that was declared a World Heritage Site by the UNESCO. 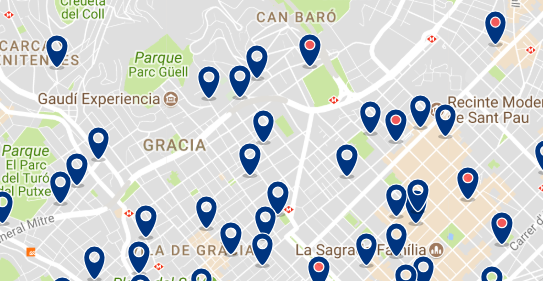 On the other hand, the nightlife in Born is very lively and is divided between bars and clubs in equal parts, most concentrated in the Passeig del Born. 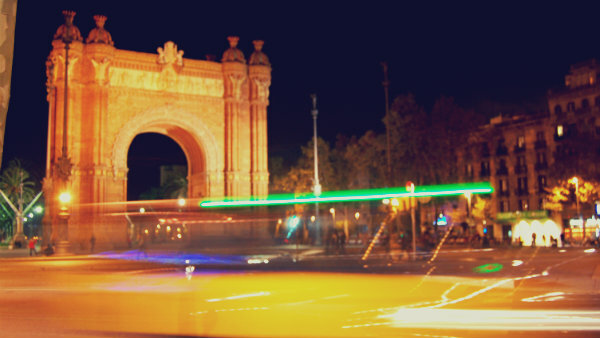 The Parc de la Ciutadella (Parc de la Ciutadella) is another recreation place located in Born and, in it, cultural events are held. This park has gardens, ping-pong tables, picnic areas and everything you need to spend time outdoors. 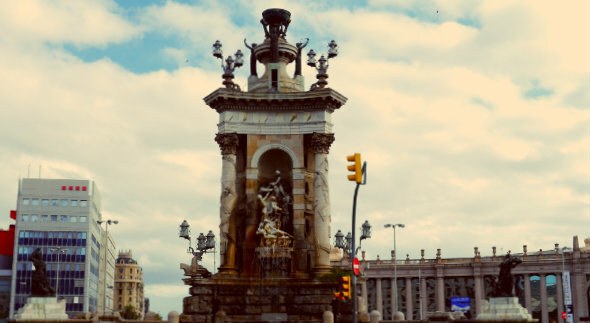 Born is one of the best areas to stay in Barcelona if you want to be at the center of events and, at the same time, know an essential part of the history of the city. This neighbourhood connects with other districts on lines 1 and 4 of the metro, with stations such as Urquinaona, Jaume I and Barceloneta. Exe Laietana Palace is housed in a renovated neoclassical building. The rooms have a flat-screen TV and hydromassage showers. Pension Francia offers rooms with shared bathrooms, in the central Born district of Barcelona. This boutique hotel has a rooftop pool, restaurant and elegant rooms with free Wi-Fi. El Raval is one of Barcelona’s hipsters neighbourhoods and has an excellent location in the heart of the city, ​​just west of the famous pedestrian street known as Ramblas de Barcelona This picturesque place, which in the past had negative connotations for its high rate of prostitution, has become in recent years the favourite area of ​​those who prefer the alternative movement. Raval has many tapas bars and restaurants to go out or enjoy good live music. 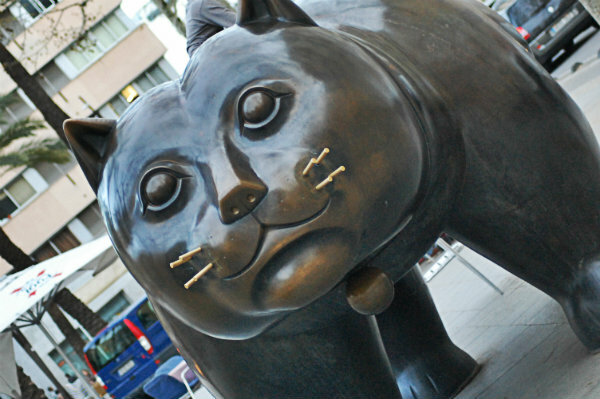 The Joaquín Costa street and the Rambla del Raval (which is the home of the famous Botero cat, symbol of the neighbourhood) are where the entertainment is more easily found. In addition, Raval also includes boutiques, second-hand stores and bookstores that make it one of the best areas to stay in Barcelona for vintage shopping. The Antic Hospital of the Santa Creu (which was the main hospital in Barcelona until the mid-twentieth century) is located in the centre of the neighbourhood. This site was declared an Artistic Historical Monument of National Interest and is the headquarters of the Biblioteca de Catalunya and the Royal Academy of Medicine. In addition, it also has gardens open to the public. Raval is connected to the rest of Barcelona by lines 1, 2 and 3 of the metro (with stations such as Drassanes, Liceu and Sant Antoni). The Filmoteca de Catalunya and the Museum of Contemporary Art complete the cultural offer of this wonderful neighbourhood which is one of the best areas to stay in Barcelona. The NH Barcelona Ramblas (formerly Hesperia Ramblas) is located in the historic center of Barcelona. This elegant hotel offers free Wi-Fi. Pensión San Ramón is located in the Raval district of Barcelona, ​​just 350 meters from the Rambla. Located in the El Raval neighbourhood of Barcelona, ​​this design hotel offers free Wi-Fi, a gym and a rooftop terrace with a pool and panoramic views. Barri Gòtic is also part of the historic centre of Barcelona, ​​located east of the Ramblas, and mixes historical monuments of Gothic architecture and Roman ruins that make it an essential visit for anyone traveling to the city. 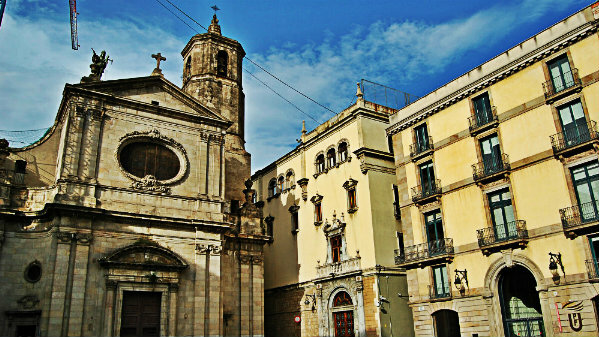 Among the many attractions that are concentrated in this neighbourhood, the Plaça de Sant Jaume is undoubtedly the most important. This 19th century square is the home of the Barcelona City Council and the Palau de la Generalitat, seat of the Catalan government. In addition, this area is home to Catalan Gothic temples such as the Cathedral of Santa Eulàlia in Barcelona and the Basilica of Santa Maria del Pi, declared an Asset of Cultural Interest. 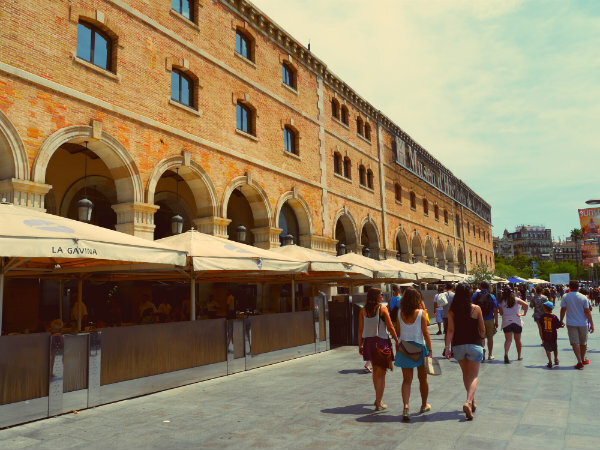 The commercial avenue Portal de l’Angel, which is the second largest shopping area in Barcelona, ​​is another reason to stay in the Barri Gòtic, especially if shopping is in your reasons to visit Barcelona. Barri Gòtic is one of the best areas to stay in Barcelona to know much of the history of Barcelona. Metro stations in the neighbourhood include Catalunya (lines 1 and 3), Urquinaona (lines 1 and 4) and Jaume I (line 4). The elegant rooms have free Wi-Fi and air conditioning, and some offer views of the Roman wall or slanted glass ceilings. Barcelona House Hotel is located in the Gothic Quarter of Barcelona and offers modern rooms with air conditioning and free internet access. This boutique hotel offers a roof terrace with swimming pool and is located in the historic center of Barcelona, ​​near the cathedral and Las Ramblas. Eixample includes the area of ​​Barcelona that was enlarged during the execution of the Cerdà Plan, by Ildefons Cerdà, in 1860. This immense district is located to the north of the Plaça de Catalunya and served as an example for other European cities that, after the success of the Cerdà Plan, extended their commercial and residential areas. In Eixample you will find some of the most important attractions of Barcelona such as the Basilica and Temple Expiatori of the Sagrada Família by Antoni Gaudí, an impressive temple of modernist architecture that began in 1883 and it is expected to be completed in 2026. 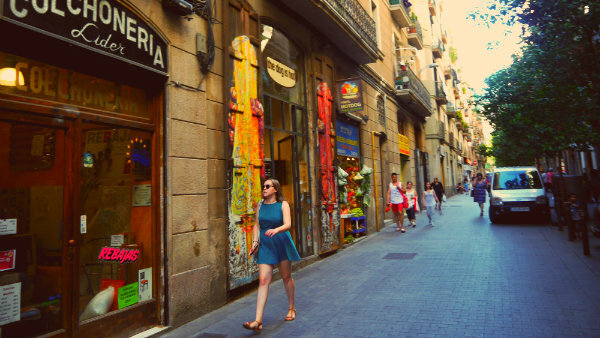 Eixample is also an important Barcelona business district thanks to the Passeig de Gràci, an avenue full of stores of all kinds, restaurants and architectural landmarks such as Casa Batlló (also by Gaudí) and the Casa Amatller by the architect Josep Puig i Cadafalch. Eixample is one of the best areas to stay in Barcelona if you want to know the modern facet of the city and stay close to some of its main points of interest. In addition, this district has many metro connections, highlighting the stations Passeig de Gràci and Universitat to the centre of the district, Sagrada Familia to the east, Diagonal to the north and Hospital Clínic to the west. Located 500 meters from Passeig de Gràcia, this elegant hotel offers a gym, sauna and a rooftop terrace with seasonal pool. Set in a restored 19th-century building, it offers free Wi-Fi and an outdoor terrace. It is a 2-minute walk from Gaudí’s Casa Batlló. The Hotel Omm in Barcelona offers elegant accommodation on Paseo de Gracia. In addition, there is a rooftop pool and terrace with excellent views of Barcelona. The Barceloneta was, in the past, a residential area of ​​fishermen due to its proximity to the sea and has the busiest beaches of the Iberian Peninsula. This lively area of ​​narrow streets is centrally located, which means that, when staying at Barceloneta, visitors can stay close to other important tourist stops. As a good coastal area, Barceloneta stands out in a special way for its gastronomy that includes delicious dishes with seafood, fresh fish and, of course, paella. Other points of reference in this area are the Mercat de La Barceloneta (known for being one of the oldest street markets in Barcelona) and the Cable Car of the Port that crosses the neighbourhood from the Torre de San Sebastián to the Mirador de Miramar and provides excellent views of the beach. As far as cultural attractions are concerned, Barceloneta has the Museu d’Història de Catalunya, within the Palau del Mar (Palace of the Sea), in the Passeig de Borbó. This museum exhibits the history of Catalonia, distributed in four floors that go from the past to the present. La Barceloneta is one of the best areas to stay in Barcelona if you want to enjoy the sea and, at the same time, have a good location during your stay. 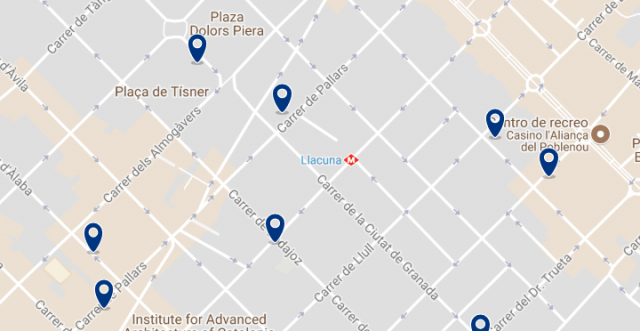 Among the nearby metro stations are Barceloneta and Ciutadella | Vila Olímpica on line 4. This design hotel is located in the maritime district of Barceloneta, in Barcelona. It offers an elegant terrace with views of the harbor. It offers an unbeatable location on Barcelona’s Barceloneta beach and has a 24-hour reception and a Wi-Fi zone. The W Barcelona offers a spa, an infinity pool, a rooftop bar and luxury rooms. The Gràcia district is one of the most iconic in Barcelona. Although it was an independent town until 1897, it has become one of the favorite places for locals and visitors to the city. 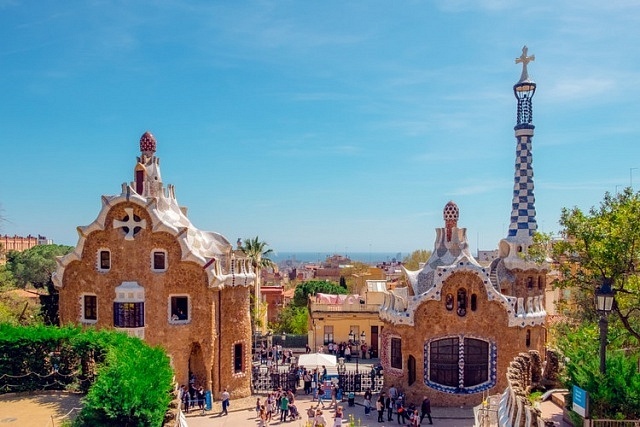 One of the emblematic places of Gràcia is the parc Güell, a work of the modernist architect Antoni Gaudí that was inspired by English gardens. This huge park is a landmark of Catalan modernism and has a viewpoint that offers excellent views of Barcelona, ​​making it a popular attraction for those who want to take photographs. Gràcia gives off a bohemian atmosphere that includes the squares Plaça del Diamant, the Plaça del Nord or the Plaça de la Vila de Gràcia, all with a special charm thanks to its cobbled streets and terraces. The surroundings of Gràcia are also ideal for tapas and excellent cuisine. In addition, this district fills with color during the Gràcia parties in August, with shows for the whole family. Gràcia is one of the best areas to stay in Barcelona if you want to know the bohemian scene of the Catalan capital. The subway stations of the district include Verdaguer, Joanic and Fontana. Located 600 meters from Park Güell, Catalonia Park Güell offers free WiFi and a rooftop pool. The property is housed in a renovated classic-style building and offers free Wi-Fi access in all areas. This modernist building is at the beginning of the elegant Paseo de Gracia in Barcelona. It has a sauna, gym and terrace with swimming pool. Sants-Montjuïc is the largest district in Barcelona, so there is always something to see and do in its streets. Located in the foothills of the mountain of Montjuïc, this neighbourhood combines both the beach side and the mountainous side of the Catalan capital, which is why sleeping in any of its many accommodation options gives you a broad vision of Barcelona. This area is the home of the Parc de Montjuïc, a vegetable lung with viewpoints that will allow you to contemplate the city in its entirety. In the same way, Sants-Montjuïc is the headquarters of the main train station in Barcelona: Estació Sants, with national, international and local trips. Other icons of Sants-Montjuïc are the Plaza España square(where Barcelona’s avenues such as Gran Vía, Parallel or Reina Maria Cristina meet), as well as the Montjüic Olympic Ring of the 1992 Olympic Games, the National Museum of Art of Catalonia and the Joan Miró Foundation. Sants-Montjuïc is one of the best areas to stay in Barcelona because it allows you to travel to other cities thanks to its excellent train connections. In addition, this district is close to important attractions of Barcelona and has several metro stations. 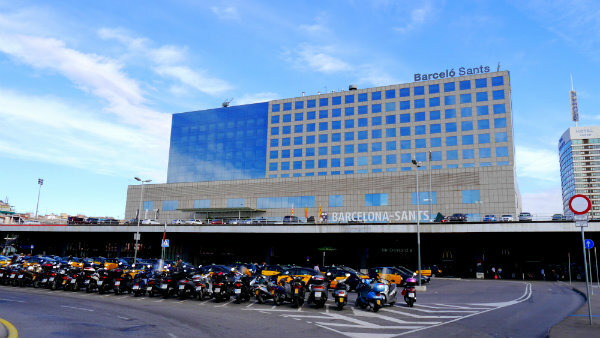 The Barceló Sants offers minimalist rooms with free Wi-Fi, a rain shower and large windows overlooking the city. It offers free Wi-Fi throughout the hotel and a 24-hour reception service. Miramar Barcelona offers views of the Mediterranean Sea, 2 swimming pools, free Wi-Fi and rooms with great views of Barcelona. Poblenou is a Barcelonean area known for its importance during the Industrial Revolution, since it housed most of the Catalan companies, which is why it was known as the factory or the workshop in Barcelona. This charming neighbourhood is located in the Sant Martí district and has among its main attractions the 22@ (also known as Districte de la Innovació ), a modern architectural complex that houses companies from different fields, especially related to technology and innovation. 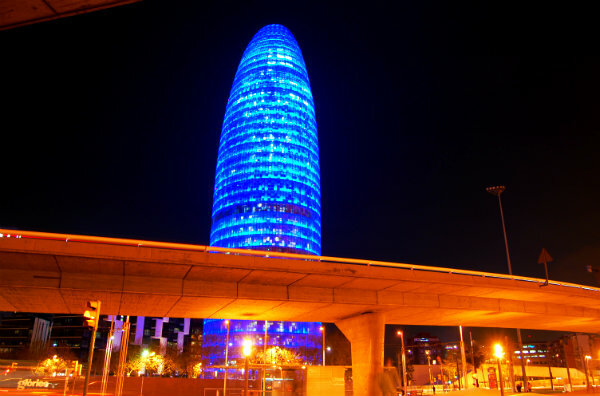 The entrance to 22@ is marked by the Torre Agbar a 38-story building designed by French architect Jean Nouvel. 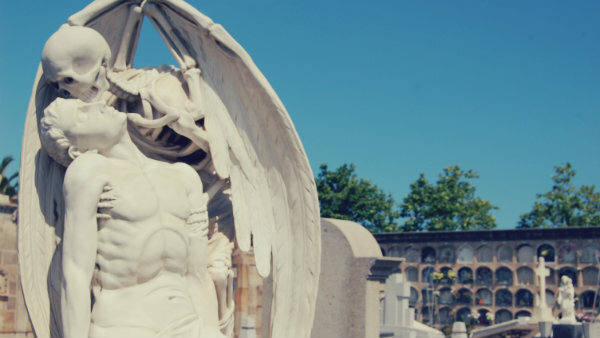 Another place of importance at the architectural level is the Cemetery of Poblenou, thanks in large part to sculptures such as the Kiss of Death, of neoclassical style. The Rambla de Poblenou is the main commercial artery of the neighboUrhood and, in it, you can taste excellent Catalan cuisine, attend a theatre play or enjoy tapas, as well as go shopping and clubbing. This rambla makes Poblenou one of the best areas to stay in Barcelona for nightlife. Poblenou also has two urban beaches that stand out for being less visited than those of Barceloneta, since they do not have such a central location. One of the beaches is Mar Bella, known for being nudist and gay-friendly, while the other is Bogatell, which usually attracts middle-aged people. Poblenou is one of the best areas to stay in Barcelona due to its proximity to beaches. The subway stations of the neighbourhood include Poblenou on line 4. The Gates Hotel Diagonal Barcelona is an elegant hotel located next to the Torre Agbar. It has an impressive rooftop pool. Travelodge Barcelona Poblenou is located in the district of 22@, 600 meters from Bogatell Beach, and offers air-conditioned rooms. Hotel SB Glow **** Sup offers a sauna and a bicycle rental service. The hotel is located in the Sant Martí district, 1.7 km from Port Olímpic. Les Corts is a neighbourhood famous for hosting Camp Nou, the stadium of Fútbol Club Barcelona which has a capacity for almost 100 thousand people, being the largest in the European continent. Similarly, the Palau Reial de Pedralbes (former residence of the royal family) is also in Les Corts and includes the Pedralbes gardens. This district is also a residential area full of gardens and exclusivity, where it is not strange to meet Catalan and international celebrities who choose it as a definitive or temporary home. In terms of things to do, Les Corts has a Avinguda Diagonal, a shopping street full of stores ideal for luxury shopping, restaurants and nightclubs, as well as iconic places such as the Barcelona Bikini, a concert venue. 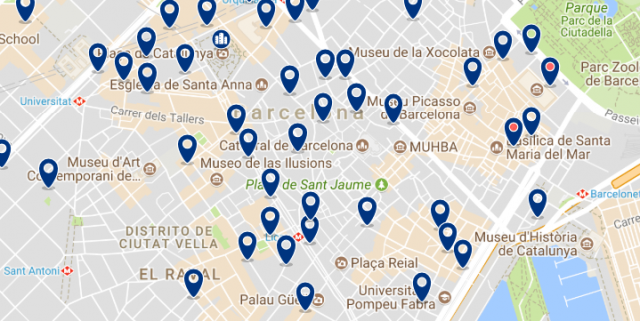 Despite not having a central location, Les Corts has metro stations such as Palau Reial and Zona Universitària (both on line 3) that connect with the rest of Barcelona and make moving to other attractions an easy task. Les Corts is one of the best areas to stay in Barcelona to attend sporting events or enjoy the most exclusive facet of the Catalan capital. There is always something to see and do in this beautiful neighbourhood. The elegant Catalonia Rigoletto offers an outdoor pool and rooms with a flat-screen TV and free Wi-Fi. The Derby is 300 meters from L’Illa Diagonal Shopping Center and 20 minutes’ walk from Camp Nou, the FC Barcelona Stadium. 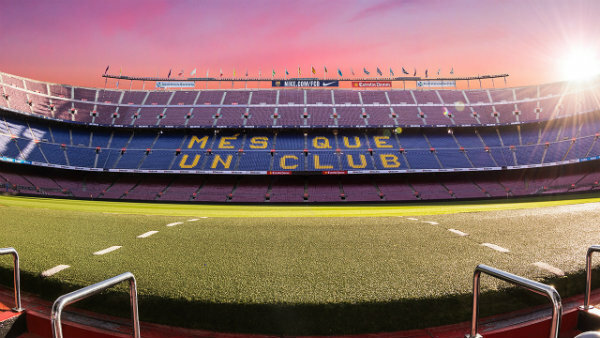 Overlooking the Camp Nou, NH Barcelona Stadium offers free Wi-Fi and a gym, as well as a seasonal rooftop pool. 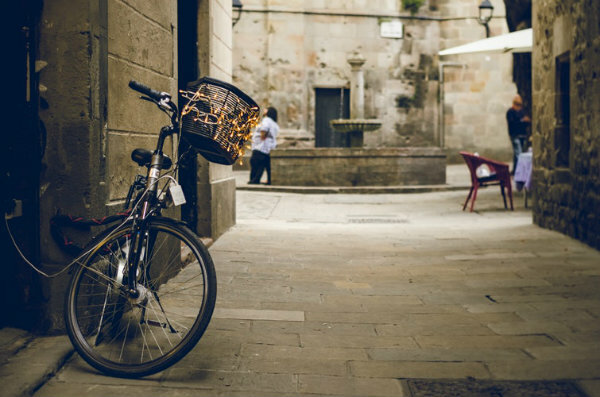 Sarrià-Sant Gervasi is a mostly residential district, making it one of the best areas to stay in Barcelona if you want peace of mind during your stay in the Catalan capital. This area is next to the most important green lung of Barcelona: The Parc de Collserola, with more than 8000 hectares of forests that include fountains and viewpoints ideal for hiking or enjoying the best views of the city. The Parc d’Atraccions is another point of interest in Sarrià-Sant Gervasi. It is an amusement park with more than 100 years of history and attractions for all ages where families of visitors can spend an unforgettable time. 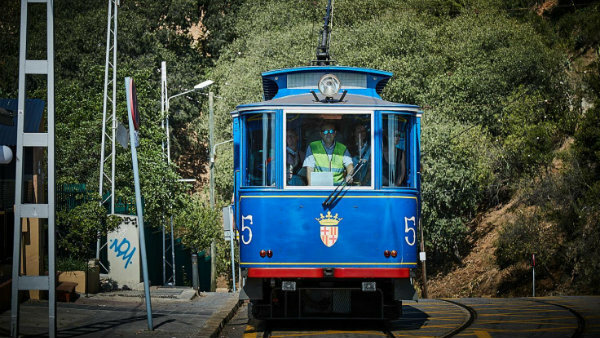 Despite not having metro stations, Sarrià-Sant Gervasi has railways and the Tramvia Blau, a blue tram that was inaugurated in 1901 and reaches the Tibidabo mountain. Sarrià-Sant Gervasi is one of the best areas to stay in Barcelona if you travel with children or family. This modern hotel has a library, a free-use work area and an exhibition area for works by local artists. This elegant hotel offers modern rooms with free internet access. The functional rooms have air conditioning. This boutique hotel is surrounded by gardens and is a 5-minute walk from Les Tres Torres railway station.